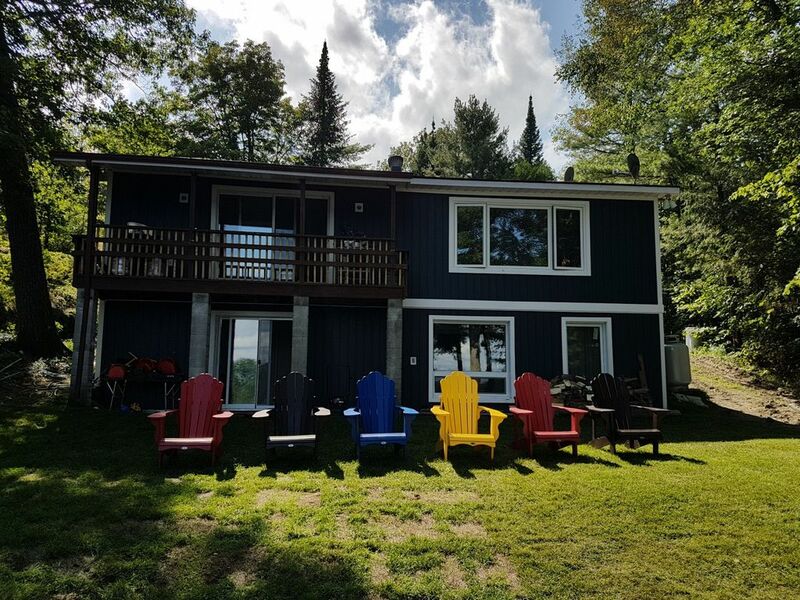 This pristine 1900 sq.ft cottage is situated overlooking beautiful Brandy Lake, just minutes from Port Carling. Located at the end of a cul-du-sac it doesn't get much more private than here. Lots of parking and no neighbors too close. It has a private shoreline with sun all day and glorious sunrises! The sandy beach is steps down from the cottage and is ideal for all water activities. Enjoy walks, running and cycling on the hilly cottage road. At night, roast some marshmallows on the campfire, while relaxing on the muskoka chairs. The interior is bright with gorgeous shiplap walls and all new flooring. The open concept kitchen/dining/living faces out to fabulous views of the lake. For entertainment there is a flat screen TV with satellite and indoor speakers with different zones for playing your favourite tunes. For families with small children, there is a children's play set on the front lawn and crib and high chair available. The complete gourmet kitchen has all the appliances and amenities. The built in island and seating area is ideal for relaxing breakfasts or a quick snack. Sliding glass doors lead onto upper deck and offers an excellent view of the lake with a propane gas barbecue. With one bedroom upstairs, the lower level has 3 bedrooms and a smaller family room with a TV and a table tennis table. Sliding glass doors take you out from here to the lawn, ideal for kicking around a soccer ball or playing a game of badminton. Just off the lawn there is a (new coming Spring 2018) large 16' x 16' deck overlooking the beach with fabulous views of the lake. With three kayaks at your disposal, be sure to take to the water and enjoy all that the lake has to offer. Try your hand at fishing for bass, pike and perch. Groceries and shopping are just a short car ride away in Port Carling. There are wonderful restaurants, farmer's markets, local activities, attractions and adventures to discover.